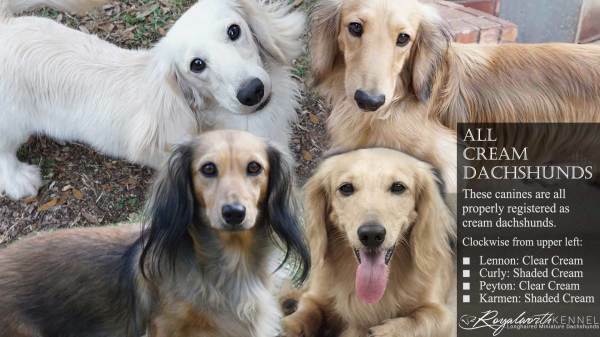 The English Cream lines are often described as the elegant of the breed and there are many dachshunds described as "cream"-some are golden, strawberry, blonde, some have black hair mixed with their blond (referred to as "shading", and some have no black at all, which is called "clear". For many years, the term "English cream" has been used in the U.S. marketplace to refer to dogs that are considered "true" creams originating from a breed developed in England, as opposed to dilute red. This is important to someone seeking a cream pup because dogs referred to as "English" cream have a genetic modification that turns the red coat cream. As they get older, they will often continue to lighten, but will remain cream throughout their life but dilute red pups, which may look identical to creams in their early months, will continue to redden with age and will generally develop the appearance of being a red dog. This may be very important if you have a particular preference in the adult appearance of your dachshund. "Shaded creams:" There is a tremendous variety in appearance in creams. The primary cause for the appearance difference is "shading:" black hair mixed with the blond. As adults, this black hair is often seen at the tips of the dog's ears and tail, but may be more extensive. In years past, shading has been preferred because it makes lines of a well-structured dog more prominent. almost like outlining a drawing. It also helps to retain proper dark feature pigment that gives dachshunds great eyeliner, deep eye color and other nicely pigmented features. This is not only cosmetically preferred, but has health benefits. "Clear cream:" More recently, there has been a growing trend for creams without shading. These pups are referred to as "clear" and are genetically incapable of producing any black hair. Because removing pigment is increasingly recessive, finding good representations of these pups can be challenging; that is, pups that are not too closely bred and have not lost good feature pigment. Additionally, while these pups look comparatively very light when young, they tend to "color-up" becoming darker with age. In the photo below, the dog Peyton, (a clear cream), was born white and became darker with age. By contrast, the dog Curly, (a shaded cream), was born black and lightened with age. As you can see, as adults, these dogs are very similar. Finding the cream puppy you want.. The easiest way to find your ideal cream pup is to show a good breeder photos of adult dachshunds that you like. A breeder familiar with their lines will usually be able to project the likely appearance of their cream pups. Because these pups change in the first months of life, their early appearance can be misleading to prospective owners. This is why providing photos of adults is important. Puppies are cute, but a good breeder wants you to have an adult you will enjoy. Feel free to use the photo above as a reference to communicate your preferences. How can you tell if a dachshund is a true English Cream? The Chinchilla gene series is responsible for the change of appearance from red to cream. This gene effects the base coat color red, and the points color, tan (i.e., the color above the eyes, along the nose, etc.). This gene does not affect black and chocolate pigments. So, when the allele for the chincilla gene is present, the red base coat is diluted to cream, but any shading is unaffected. These puppies will be born very dark in color. However,over the course of the first months of life their cream color will emerge from their roots and slowly overtake the dark birth color. Some of these puppies will ultimately become light enough that they will lose the appearance of any shading. The key to identifying these pups is evidence that they were born black and are progressing toward cream. Regardless of the amount of shading retained, these pups are rightly referred to as shaded cream. When recessive reds are overwritten with two Chinchilla genes, the puppies will become cream without any shading. These puppies are born very light in color, often near white and are called "clear cream." The key to identifying these pups is evidence that they were born very light without any trace of a black overlay. These pups will typically become more gold, deepening in color over time. Please note that the dachshund coat is not fully developed until two years of age, so a long-haired puppy may not appear to have very long hair in infancy. * True cream dachshunds are generally thought to have the most mellow temperament of the breed. shading and will typically become more gold. We hope this information has been helpful to you. We are proud to offer true cream pups to loving families, If you have futher questions, please feel free to contact us or Paige at Royalworth Dachshunds. "Don't Stop Believing! "Faithfully...we strive for excellence in our breeding program..Longhaired Dachshunds, Long-Haired Dachshunds, Long Coat Dachshunds, Short Coat Dachshunds, Smooth Coat Dachshunds, Champion Line Dachshunds, AKC Registered Miniature Dachshund puppies, AKC Registered Long Haired Dachshunds, Piebald Long Haired Dachshunds, PIebald Smooth Coat Dachshunds, Red Long Coat Dachshunds, Red Smooth Coat Dachshund puppies, Black and Tan Smooth Coat Dachshund puppies, Black and Tan Long Haired Dachshund Puppies, Dapple Dachshund puppies, Long Haired Dapple Dachshund Puppies, English Cream Long Haired Dachshunds, English Cream Long Haired Dachshund Puppies, EE Cream Long Hiared Dachshund Puppies, EE Cream Smooth Haired Dachshund Puppies, Clear Cream Dachshund puppies, Chocolate and Tan Long Haired Dachshund Puppies, Chocolate and Tan Smooth Haired Dachshund puppies.